At the dementia care home where I worked we had a large echoey, quite empty dining room. We were always trying to think of ways to make it more friendly and interesting for the residents. People with dementia often suffer from boredom, but flounder in any activities that would usually satisfy it due to their memory loss, side effects of medication, etc. We had a menu board in the living room, updated daily, that a resident would often read to me (repeatedly) “oh look, it says Shepherds Pie” three minutes later… “Do you like Shepherds Pie? its on the menu today”. Anyway, that kept her occupied in a way. Down the other end of the dining room we are planning a bar/pub area. Surprisingly (to me) this has needed a lot of explanation and justification to both higher management and staff. A pub is, for many people, a happy and familiar place. In the fight against institutionalism and for personalisation, why wouldn’t you include a pub in the very confined setting that is to our residents, their whole world. We would love to regularly take our residents to the local pub for outings but in reality, friends and family rarely want to help, and we can’t afford the staff we’d need to accompany the residents. So the best option seemed to build a little pub area where we can perch at the bar, do a pub quiz, pub singalong, play velcro darts, and have a bit of banter and chat etc. Anyway, unfortunately I have now left this job to live in Japan, but I hope they will continue to try and get the pub installed! There are two new murals that I painted at the dementia nursing care home where I work in collaboration with the residents. 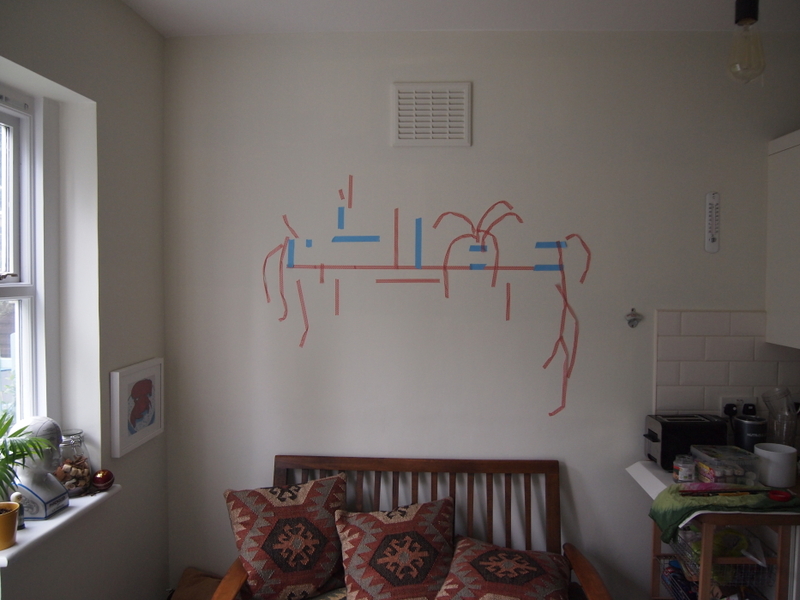 You can see more pictures and some thoughts on the processes over in the mural section. Rose cottage is our new shed. The London map mural is in a corridor on the ground floor. A prompt for reminiscence, and decoration. 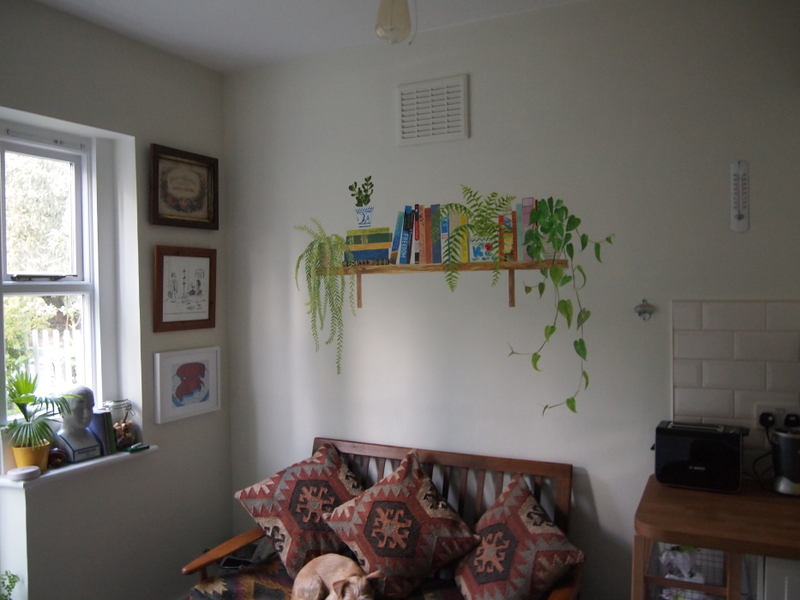 I recently finished a lovely commission which was to paint a bookshelf with dangly plants onto a kitchen wall. The clients chose some book titles and let their friends make suggestions too. As they have kindles/e-readers they don’t have a need for many books in their house anymore. 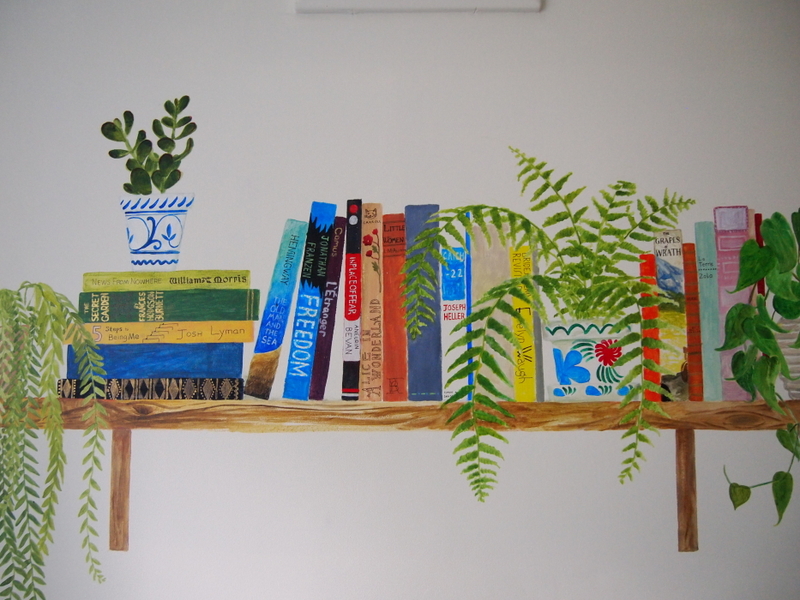 Using coloured masking tape to mark out where the plants and books would be.